The eyecatching feature of the Walkie-Talkie, at 20 Fenchurch Street, is that it curves outwards towards its top, so the highest floors are larger than those lower down, giving it the appearance of a giant telephone receiver popping up through the city's buildings. Designed by Rafael Viñoly, it is due to open in April 2014, and while most of us usually have to make do with the external appearances of towers in the financial district, this time there will be a "skygarden" open to the public. The plan is that it will be free, but require advanced booking. We'll see how that goes. 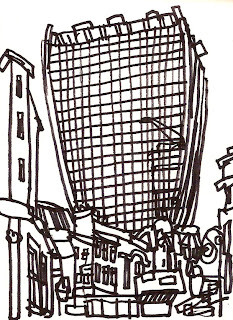 There's more about the Walkie-Talkie at www.james-hobbs.blogspot.com. After what seems like forever, the weather's finally getting warmer. My favourite time of year is when the blossom is out in full bloom; some trees are a little early this year but the rest are just starting to catch up. I couldn't resist getting outside today and drawing these trees near where I live, in Brockley - I meant to draw them last year but they blossom for such a brief period that I missed it last time around. 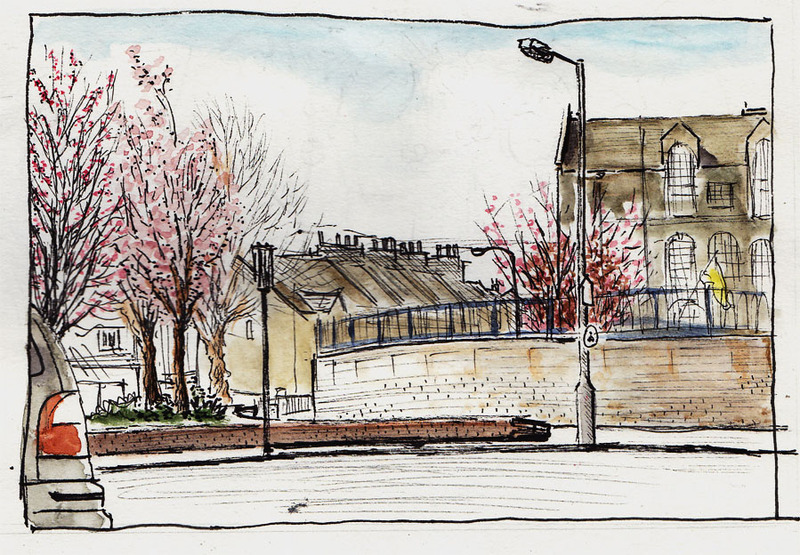 I've not had the opportunity to do much sketching outside lately, so it was nice to make the time, doubly so for being able to sit in the sun without worrying about taking a jacket! I'll be trying to catch a few more blossom trees before it all gets blown away. 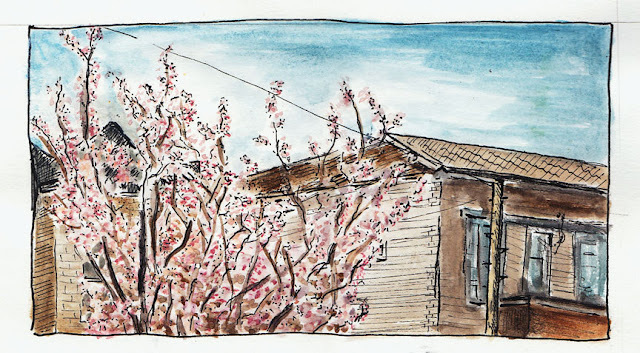 Although he was referring to hawthorn blossom, which arrives slightly later, David Hockney's term 'Action Week' applies equally well to the cherry blossom; it doesn't last long, so it's worth making the time for a sketch!